Not too long ago, quinoa was a humble seed eaten by rural people and the urban poor. In Peru’s cities people would turn up their noses at its sight, given its lack of status, in their efforts to climb the social ladder. Now quinoa is chic. It comes dressed with recommendations from Martha Stewart to Gwyneth Paltrow. Major newspapers trumpet its arrival. It graces the plates of elite restaurants. Quinoa is taking the world, one mouthful at a time. While it was a staple in Inca times this tiny seed, smaller than the proverbial mustard seed, faded before grains the Spanish brought–wheat, barley, oats, and rice. 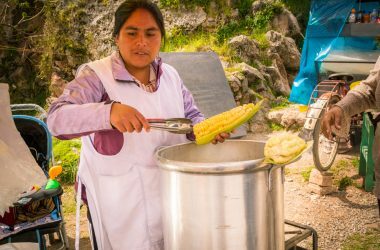 It never lost its place among rural peoples who made a kind of bread from it called quispiña, ate it as a nourishing gruel called (pesque), stocked soups with it (sopa de quinua), or ate it on their plates with meat where city folk and wannabes would eat rice (pisarra). It still was a staple, though a humble one. It’s plants, like those of mustard, could grow very tall. In some cases they were reported to grow more than two meters tall. Its showy stalks drew the eye in Andean landscapes from lowlands to highlands. 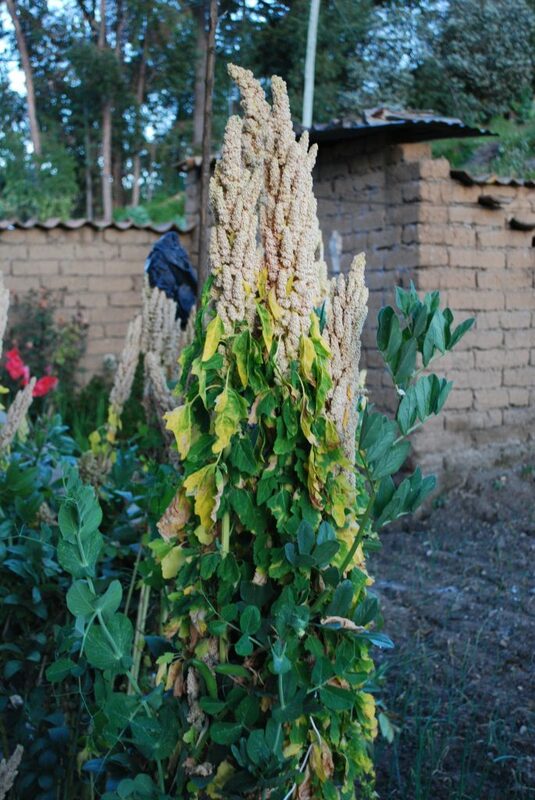 In rural Peru many different varieties of quinoa are cultivated. 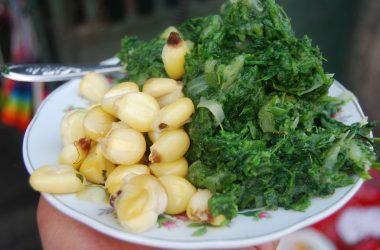 Like other Andean foods, it has adapted to an infinity of micro-climates in this mountainous vertical landscape. But only certain varieties are widely marketed. Most recently red and now black quinoa has found a new niche on the shelves of up-scale stores and Internet marketers, as well as the pots of innovative, elite chefs and entrepreneurs. 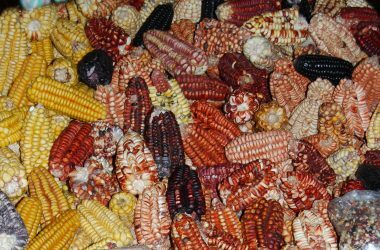 Its mainstream commercial self, off white and slightly greenish, was once found only in organic stores outside Peru and there it was only found in rural markets or the side corners of urban ones. Now it is common fare in supermarkets for ordinary people all over the place. But, like the potato before it, only a small number of varieties will make it into the international marketplace. Peru will keep its genetic base of variety, as long as the market doesn’t demand people only produce in mass a few varieties with intensive, chemically based cultivation. As long as people live, often struggling for their existence, on mountain slopes far removed from cities and roads, quinoa will continue to grow in a rainbow of varieties. It’s official: Quinoa has achieved cult status. 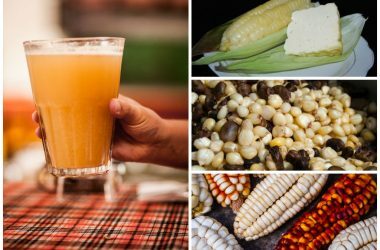 The ancient Incan grain has captured the public’s imagination with its mix of nutritional superpowers, delicious flavor and rainbow colors, popping up on trendy restaurant menus and holistic health websites alike. With all nine essential amino acids, it’s a complete protein — like meat — which makes it the Holy Grail of the vegetarian world. And, it’s gluten-free. The only question is whether it grows magic beanstalks, too . . . This article hit the wires and was widely reproduced, such as in the Santa Fe New Mexican. It even made it to Peru. (See this as well). Chef Anna Hansen proclaimed quinoa’s value in London’s Sunday Telegraph. The Montreal Gazette, recognizing the international impact of celebrity chef Jamie Oliver, claimed Quinoa could “Get kinds into the kitchen” by “creating allies instead of enemies.” And, the UK’s Observer Magazine exclaimed the Gwynneth Paltrow is “quinoa-tinted. All this and more in only a week. Quinoa’s ubiquity in the English world is stunning, when twenty years ago almost no one had even heard of it. While it graces the Anglo Saxon world, on all sides of the various oceans, it still makes a home in Cuzco. One can buy quinoa enhanced bread in bakeries, the seeds in its various markets, soup with quinoa at stands throughout the city, and find it in the city’s finest restaurants. While the seed is well hyped these days, it has two very important features that lay at the root of all the tumult, beyond all the noise of the marketing industry. It is nutritious and it is tasty. It is worth going to Cuzco for quinoa. 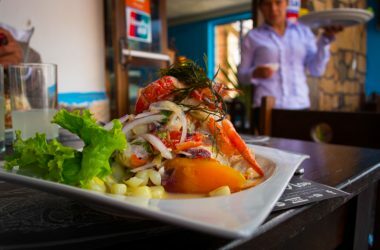 But there are consequences to the international popularity for Peruvians and their neighbors, as this article states for nearby Bolivia. International popularity leads to rising prices making quinoa unaffordable for many people.